One Love is a joyful and optimistic book that will give your child a deeper understanding of what love looks and feels like. It begins with the familiar refrain from the Bob Marley song (“One love, one heart, let’s get together and feel all right”) and threads it throughout the book. The book shows young readers examples of different forms of love, such as love among family members, love for the Earth (including its rivers, flowers, trees, and bees), and love among members of a community. It also conveys a larger message about the important role that everyone can play in sharing love that rises above race, age, gender, and other differences. At ICIC, we use One Love in all of our programs. It is the centerpiece of a Dancing With Books classroom residency theme that we have given the same name: “One Love.” We also use it in our Naptime U. professional development workshops and in our Read With Me family literacy program. We make One Love leap off the page for young children through original music we created based on the words in the book, African drumming, and extensive use of meaningful gestures to build their knowledge of key words in the book. In each of our programs, One Love is one of many components (including other songs and dances from around the world and multi-cultural books) that we use to develop children’s awareness of global cultures and diversity. We also use One Love’s message of love, compassion, and humanity to support children’s social-emotional skills and build community. Toward that end, we have developed a Read With Me workshop entitled “One Love: Creating Family Connection with World Music” that is designed to create a joyful family experience around world music and literacy. At a recent workshop in Anacostia, for example, ICIC brought toddlers, preschool children, older siblings, and their parents together in a vibrant celebration of music, drumming, movement, and meaningful gestures, all focused on One Love and other picture books. · Read. Research has made clear that reading with your child is an effective way to help your child develop literacy skills. Make it a regular practice to set aside time to sit down with the early learners in your home and read together. No matter what your reading level or your child’s is, there are abundant social-emotional and learning benefits to doing so. You can read to your child, have your child read to you, or make up a story together based on the pictures. · Visit. Help your child discover how many of the elements of One Love are in your neighborhood. Explore your neighborhood or city together, looking for real world examples of families, flowers, trees, rivers—and, most importantly, people building a better world together. Take One Love and other books with you when you go. · Love. Support your child’s discovery and understanding of what love means to her or him. What does love look and feel like in your home? Does it involve laughing, singing, or playing together? Does it mean showing kindness to a sibling? What are your child’s favorite ways to express and receive love? Are those ways the same for all members of your family or are there differences? What does it mean to have love for one’s community or the Earth? · Sing, dance, and drum. 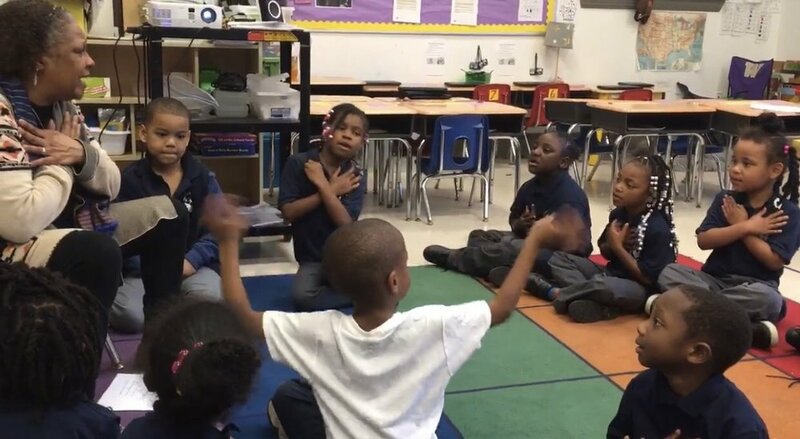 ICIC uses original music and lots of expressive, meaningful gestures when we present our One Love residency in classrooms that participate in our Dancing With Books program. We make a heart symbol with our hands when we sing “one love,” put our hands over our heart when we sing “one heart,” pretend to stir a big pot when we sing “let’s get together,” then flutter our hands happily at our sides when we sing “feel all right.” At other points during the song, we move our arms like flowing rivers, use our fingers to pretend to sniff fragrant flowers, and bend our arms up from our elbows to represent trees. We do all of this against the rhythmic backdrop of an African drum. You can have the same fun at home with your child by making up your own song and meaningful gestures, and tapping on any safe, hard, safe surface to create a drum backdrop. · Make. To cap off your adventure of love and literacy, have your child create an original picture book based on the understanding of love that your child expresses in the “Love” activity described above .You only need simple materials like scrap paper, crayons or markers, and a stapler. Let your child draw the pictures freely without, any criticisms or corrections. You can let your child write the words, let your child dictate them to you, or do a combination of both. A blog can never fully express the feeling of love and belonging that children experience when they participate in Inner City-Inner Child’s arts-based literacy programs. To learn more about how to support our work, we invite you to watch our video and click here. From ICIC to you and your child, one love! For more than two decades, Inner City-Inner Child (ICIC) has supported early childhood education in Washington, DC through arts education programs and early childhood development training. We provide quality arts integration and early childhood development programs that serve low-income families in DC. ICIC also provides arts-focused professional development programs for teachers who work in early childhood centers and school-based early childhood education programs in DC. In addition, we engage low-income DC parents in child development activities that help them create learning experiences at home. Happy summer from Inner City-Inner Child (ICIC)! We hope you enjoyed reading Skip through the Seasons (which we featured in our June 2018 blog [hyperlink]) with your child last month. Our summer reading selection this month is Bear on a Bike, another gem by Stella Blackstone (with illustrations by Debbie Harter). For the many families for whom “summer vacation” means “summer staycation,” there is good news! Bear on a Bike will take you and your early learner on an exciting adventure without having to leave home. The book invites readers to follow a cheerful brown bear, a curious young boy, and a playful puppy as they use different forms of transportation (including a bike, a boat, and a train) to explore far-way destinations like a forest, an island, and a castle. Bear on a Bike’s rhyming pattern, question-and-answer format, and gorgeous pictures will keep you and your child turning page after page to follow this trio’s delightful travels. The original music and choreography that ICIC has created to bring Bear on a Book to life in our Dancing With Books classroom residency program show our work at its best. We use the book as part of a residency theme that we call Imaginary Journeys, in which we teach children that a book and their imagination can them anywhere they want to go. Together, we go on an expedition around the world, using African, Latin, and Washington, DC’s own go-go art forms to set the scene for our journey. We also encourage children to create their own movements to express the words and concepts that they encounter in the book (for example, flying on a rocket). · Read. Studies show that reading a book with your child is one of the most effective ways to help your child learn to read. Set aside some time, get comfortable, and get ready for you and your child to enjoy the social-emotional and learning benefits that result from enjoying a book together. You don’t have to be a perfect reader. You can read to your child, have your child read to you, or make up a story together based on the pictures. · Visit. Go on an adventure with your child or around your neighborhood or city and discover destinations similar to those that the bear visits in Bear on a Bike. That is an easy challenge in a city like Washington, DC, which has: markets (try a farmer’s market or Eastern Market); forests (visit Rock Creek Park or another safe, wooded area with hiking trails); forest creatures at the National Zoo; islands (Kingman Island and Theodore Roosevelt Island, to name two); and a castle (the Smithsonian Castle). DC also has many examples of transportation similar to those in the book, including bikes, trains, boats, and even rockets (at the National Air and Space Museum). Be sure to take Bear on a Bike and other books with you on your adventure. · Imagine. Have your child dream up an imaginary journey of her or his own. Where would she or he go? What forms of transportation would she or he use? What animals or other travel companions would be on the journey? Consider taking a few photos of your child at different destinations around the neighborhood or city to make the journey real. You might also want to use the photos for the “Make” activity below. · Sing, dance, and drum. ICIC uses an original song we created entitled “Let’s Go Traveling” when we present our Imaginary Journeys residency in classrooms that participate in our Dancing With Books program. We sing and dance to the rhythm of a drum beat as we pretend to travel to Ghana, Cuba, and back to DC by boat, car, bus, train, and airplane. You can do the same at home by making up your own travel song and dances, and tapping on any safe, hard, safe surface to create the effect of a drum. · Make. Now comes the best part: have your child create an original picture book based on the journey that she or he dreams up in the “Imagine” activity above, using simple materials like scrap paper, crayons or markers, and a stapler. Allow your child to draw the pictures freely, and refrain from making criticisms or corrections. Let your child write the words, you can write them from dictation, or you can do a combination of both. A blog can only begin to convey the sense of adventure that children experience when they participate in Inner City-Inner Child’s arts-based literacy programs. To learn more about how to support our work, we invite you to watch our video and click here. Happy travels to you and your child! Summer is here again, and Inner City-Inner Child (ICIC) is ready with another round of early childhood books to recommend for summer reading! We are excited to kick off this season with Skip through the Seasons, by Stella Blackstone with illustrations by Maria Carluccio and published by Barefoot Books—a word-rich and action-filled journey through 12 months of seasons that begins with a jump into January and ends with a dance into December. Music provides young children with the critical skills they need to support their development and love of learning. It has some amazing effects on the brain, and when introduced early on it can build a strong foundation for success in school and life. “Arts for babies? What can they learn at that age?” is a reaction that Inner City-Inner Child (ICIC) sometimes gets when we describe our work with children ages zero to three (infants and toddlers). “Actually, quite a lot” is the answer that we are proud to give, as we share news about our growing activity in this area. ICIC is delighted to build upon our curriculum of arts education programs for children and announce our launch of a new infant-toddler initiative, through which we are significantly expanding our arts and literacy programming for zero- to three-year-old children. The initiative will allow us to increase our impact dramatically in early childhood education in Washington, DC, by reaching more underserved children at an earlier stage of their development. As part of this exciting work, ICIC will present research-informed classroom residencies and workshops that integrate music, movement, and visual and tactile arts with early learning. In addition to providing robust experiences for children, the workshops will demonstrate for teachers and parents engaging ways to interact with infants and toddlers that support their development, and give the young children in their care a strong foundation for success in school and life. We wrote in a previous post that the remarkable brain development that occurs between birth and age three forms a foundation for all later learning, health, and behavior. During this important stage, children learn a host of critical skills, including how to focus their vision, identify and manipulate the objects around them, imitate behavior, develop fine and gross motor skills, understand and form language, and—perhaps most importantly—develop attachments with others. A close look at what constitutes the best kind of experience for infants and young children leads quickly to the arts . . . The arts motivate and engage children in learning, stimulate memory and facilitate understanding, enhance symbolic communication, promote relationships, and provide an avenue for building competence. The arts are natural for young children. Child development specialists note that play is the business of young children; play is the way children promote and enhance their development. The arts are a most natural vehicle for play. Children like one-year-old Brandon show us the extraordinary power of the arts to support infants and toddlers in their social development in early childhood. When ICIC started a residency in Brandon’s early childhood center classroom recently, his teachers knew him as a withdrawn child who rarely participated in classroom activities. It surprised us to hear this, because it was a side of Brandon that we never saw. During the residency, in which ICIC teaching artists modeled for Brandon’s teachers ways to integrate singing and music in the classroom curriculum, Brandon responded immediately to opportunities to hold and play instruments, make his own music, imitate his teachers’ facial expressions and gestures, increase his exposure to language through learning new songs, and connect with his teachers through cuddling, marching, and making sounds with them. From the first day of the residency through the end, the Brandon whom we saw was engaged, confident, and advancing to the next stages of development. Weeks after the residency was over, Brandon continued to be engaged in arts-based activities and did not retreat back into being a disconnected, withdrawn child in his classroom. His teachers exclaimed: “The music transformed him!” For ICIC, there is no better reason to do this work. A blog is not sufficient to convey what children like Brandon gain from Inner City-Inner Child’s arts integrated infant-toddler programming. Please watch our video and click here to learn more about our work and how to support it. At Inner City-Inner Child, dance is a vitally important part of our work. Our Dancing With Books program deeply connects preschool children with books through singing, music, and movement. We celebrate all kinds of dance in our programming, including African, step, mambo, merengue, salsa, and freestyle. Dance has been integral to the human experience since ancient times. It is part of virtually every culture on the planet, and the variety of dances across the globe is astounding. But even the most avid dance fans have wondered at times, Why do we do this? There are many theories about why we dance and enjoy it so much. A common thread among them is that dance serves an evolutionary purpose and is fundamental to our survival and well-being. We highlight below the reasons for dancing that are most apparent and meaningful to early childhood education and our work at Inner City-Inner Child. The compelling connection between dance and brain function is not lost on us at Inner City-Inner Child. Our assessments show that preschool children make gains in five key learning areas—literacy, math, creativity, physical development, and social-emotional development—after participating in our Dancing With Books program. So when children in our program like Mateo work hard to master the dance steps we created to bring Eric Carle’s From Head to Toe picture book to life, they are not only having fun, but are also stimulating early childhood brain development. We see this regularly in the early child development centers and school pre-K classrooms where we conduct our Dancing With Books program. Each classroom often has at least one child who is noticeably more reluctant than others to participate when our residency begins. It is, in many cases, a child who is slow to bond with the other children and adults in the classroom in general. As children like Kayla and Madison show us, joining a dance circle gives children a special opportunity to participate with others and feel like part of the classroom community. Singing and dancing with their classmates in the circle has a remarkable way of releasing their inhibitions and improving their social development. It provides a sense of belonging that often endures long after our residency ends. If you’ve ever seen the video for Pharrell Williams’ song “Happy,” you have a clear sense that there is a strong connection between dance and happiness. But do we dance because we are happy, or does dancing make us happy? As many of us have experienced personally, the dance-happiness current can flow in either direction. What some may find surprising, however, is just how powerful the current is: dance has been shown to affect brain chemistry and improve the mood of people with depression. At Inner City-Inner Child, children like Kayla and Madison show us the power of dance to bring happiness to the spirit and feet of young children each time we enter a classroom. That is reward enough for the work that we do, yet it serves a larger purpose as well: children learn more effectively and have more positive long-term feelings about school when they are happy in the classroom. But we’ll say more about that in a future post. A blog can hardly convey the high degree of learning and profound sense of belonging and happiness that children experience when they dance, sing, and read in Inner City-Inner Child’s Dancing With Books program. To learn more about how to support our work with professional development programs in DC, we invite you to watch our video and click here. Let’s keep dancing! We wish all students, teachers, and parents a warm welcome back to school! We are excited to mark the start of the 2017-18 school year by adding a new feature to the Inner City-Inner Child blog: from time to time, we will profile the extraordinary teaching artists, early childhood teachers, and partner organizations that make our early childhood development programs a success. We begin with Magpie, the husband and wife team of Terry Leonino and Greg Artzner, who have been an integral part of Inner City-Inner Child’s teaching artist team since the inception of our Dancing With Books classroom residency program. The couple met when Terry was a student at Kent State University in Ohio, and Greg was a local resident who happened to live on the same street as Terry. After performing separately at a folk music festival at Kent State, they sought to form a band with a third musician. The trio did not materialize, but Terry and Greg combined their talents and have performed as a dynamic voice, guitar, and songwriting duo since 1973. Greg started playing guitar in fourth grade. He drew inspiration from his father, who worked for the National Urban League. By the time he and Terry met in Kent, both were serious, content-oriented musicians who were active in the civil rights movement. From the start of their career, Terry and Greg have been committed to making music with a purpose. Their music covers a vast range of social issues, including Civil War and civil rights history, environmental stewardship, and the labor movement. As talented singers, instrumentalists, and lyricists, they work comfortably across a wide spectrum of music genres, such as folk, blues, and jazz. Through the years, they have worked with luminaries such as the SNCC Freedom Singers and Pete Seeger. They have also performed the music of singer-songwriter legend Phil Ochs, and have worked closely with his sister, Sonny Ochs. With a group name like Magpie, it is not surprising that Terry and Greg are fond of birds, and that the magpie bird is, in fact, the inspiration for their name. Magpie birds have many of the characteristics that describe the pair’s personalities, and their approach to music and life. These birds are loquacious; have iridescent feathers that reflect the spectrum of the rainbow (much like broad spectrum of Terry and Greg’s music); build domed nests with shiny objects (which Terry and Greg liken to their “shiny” songs and stories); leave their nests for others to use when they are finished (in the same way that Terry and Greg seek to leave a legacy to younger generations through their music); and are celebrated in folk tales around the world as intelligent keepers of the past, present, and future. The Magpie moniker is also much quicker and easier to say and remember than Terry and Greg’s often mispronounced last names. Magpie’s lifestyle is a strong testament to their commitment to music with a purpose. They spend weeks at a time on the road, performing their music in concert halls, coffeehouses, classrooms, and other venues around the country. When they are not performing, they are often hard at work writing songs, plays, and education programs. A vacation for them is spending time at home in their mountainside residence in upstate New York. The effect of Magpie’s music on classrooms that participate in Inner City-Inner Child’s early childhood development program Dancing With Books is magical. As children like Mateo know, Magpie delivers riveting performances that bring picture books to life through an inspired layering of lyrics, voices, string arrangements, choreography, and passion—passion for teaching young children, enhancing education, and promoting their vision of a better world through the art of music. A vivid example of this is Dancing With Books’ Imaginary Journeys residency, in which Magpie amplifies Stella Blackstone’s Bear on a Bike picture book through an original song, “Let’s Go Traveling.” This upbeat tune, which encourages children to use their imagination to travel to far destinations like Cuba and Ghana, showcases Magpie’s remarkable ability to transport listeners to a distant time and place through their music. Whether performing alone or in vibrant collaboration with the African drummers, vocalists, and other teaching artists on Inner City-Inner Child’s team, Magpie’s presence in the classroom is transformative. Teachers repeatedly tell us how Magpie’s music unlocks hard to reach children, and takes children like Kayla, Madison and Mateo on a phenomenal journey that allows them to reach a new level of self-expression. Children and teachers miss Magpie when their classroom residency ends, but they are left with the enduring gift of re-imagining what it means to engage with a book. No blog can fully capture the extraordinary effect of Magpie and the rest of Inner City-Inner Child’s teaching artist team on the children in our programs. We invite you to watch our video and click here if you’d like to learn more about how to support our work. Let’s go traveling!